There’s a frenzy going on in the segment of marketing we call content marketing. Content marketers are, in many ways, growth hackers who use content and SEO tricks to pull in customers. It’s an inbound approach that’s worked well for a lot of companies. Content marketers are as hungry as ever for more content ideas to feed their customers and search engines. However, there’s increasing competition for the attention of customers. You’re in business to provide a product or service to your target customers, so you’re most likely receiving feedback from them to improve your product or service. You can take it a step further by using customer feedback and support queries to create content, since creating content is all about addressing needs. For example, we get new customers all the time who request more information on how to run mobile advertising campaigns. After browsing our support queries, I came up with the idea to run an app install campaign and create a step-by-step walk-through. To this day, the post is one of our best-performing blog posts, with most of the traffic being organic. Our top three blog posts since January 1st. If you notice a common question or concern that your customers usually talk about, this is a sign that you should create content around it. Sometimes your customers won’t tell you what’s bothering them by writing to customer support. If they’re not doing this, they’re most likely talking amongst themselves in online communities and social media. This is your chance to be proactive. Browse forums, social media groups, and relevant hashtags and keywords on Twitter to understand your customers’ (or potential customers) pain points. We all have had that moment where we’ve read a blog post and were damn sure that we could write something better. Well, do it! Search for popular blog posts in your industry and provide your own spin or opinion and make it longer and more detailed. Look for points to elaborate on or figure out what important points were missed and include them in your version. This is related to the skyscraper technique to improving your content, which I think is brilliant. However, just make sure you don’t plagiarize! Give the author of the original post credit where credit is due. Industry events and conferences are rich with content. These events are where the most intelligent and successful people in every industry gather to talk about the hottest industry trends and problems. If you don’t usually attend these events, that doesn’t mean you can’t be a part of them. The people who throw these events carefully curate topics that are relevant. If you spot a topic on a conference’s website, you can be pretty sure that that topic is a hot one and should be written about. Don’t be afraid to add your two cents to a conference session topic. You can either provide your input before the conference or provide your opinion on the session after the fact. Either way, you should have these types of events on your calendar. People want to know more about what’s hot and trending and nothing else. 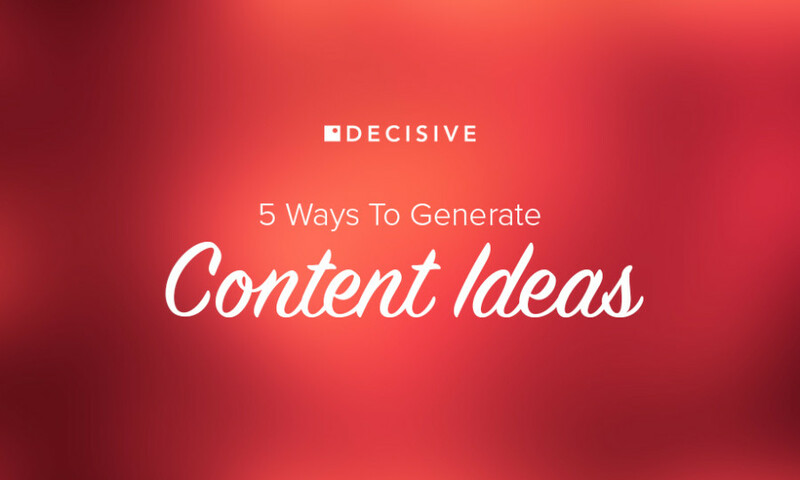 Your content has to be relevant and align with what everyone is talking about in your industry. This not only shows that you can keep your content up-to-date, it also shows that you are knowledgeable and can potentially position your blog as a great place for thought leadership. For example, we’re one of the many companies in the ad tech industry, which is a rapidly growing industry that’s seeing a lot of acquisitions. 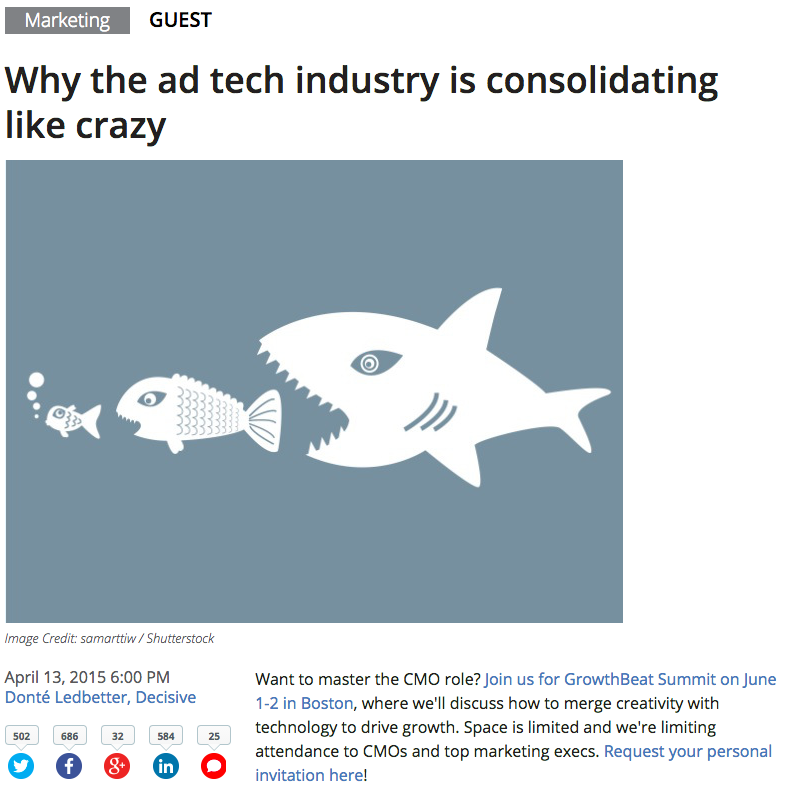 I recently wrote a guest post on “Why The Ad Tech Industry Is Consolidating Like Crazy” in VentureBeat. Even though this was a guest post on another site, the timing was perfect and ultimately drew attention to myself and the company and led to a few sign ups. Once you’re at the point where you’re consistently churning out valuable content weekly, don’t be afraid to diversify your content. This means not only writing customer-specific blog posts, but expanding to create all sorts of content, such as infographics, videos, Slideshares, quizzes, and more. Also, don’t be afraid to discuss topics that aren’t necessarily relevant to your customers, but are important to you and your company. For example, as part of our content strategy here at Decisive, we write about topics that we care about or have specific interest in (hence this blog post) instead of keeping our blog mobile advertising-specific. We’ve written about startups and tech and marketing trends. Exploring other hot topics will draw more traffic to your blog and make your blog a must-read. All in all, your content has to be valuable and/or entertaining. Your content should address the problems of everyone who visits your site. If it’s not valuable, don’t publish it.